According to Marist Fathers, the city is struggling to get back to normal. But getting refugees home is still far away. Those who remained showed courage and strength. People hope to see the conflict end across the country. Christians are involved in many initiatives for residents. 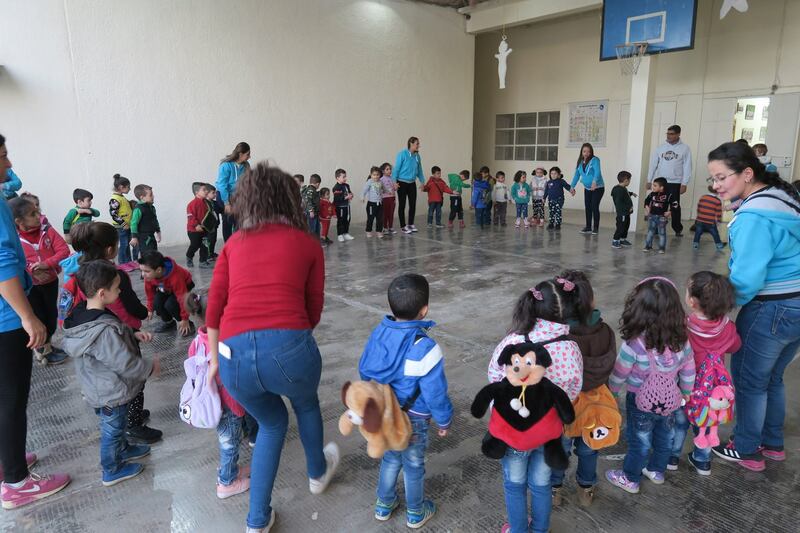 Aleppo (AsiaNews) – The return of refugees and those who fled violence would mark the end of war and a return to life, this according to the Blue Marists, in the 34th Letter from Aleppo sent to AsiaNews. Despite the city’s reunification and the restoration of basic services (water and electricity), the need to revive hope remains; otherwise, it will be impossible to stop the ongoing flow of people who still leave the country. In addition to aid programmes, it is essential to heal people, bringing peace to the whole country and end Western sanctions. Here is an edited version of the 34th letter from Aleppo, translated from the French by AsiaNews. In recent weeks, we saw several friends come back after they left the country during the war. They were often alone. Seeing the blinds of their house open or meeting them in the street revived hope in us; the long-awaited hope of their return would mean the end of the war, the end of the nightmare of emigration, and would especially mark a return to life. We visited the city with them. We became tour guides for the destroyed souks and neighbourhoods ravaged by hatred. It was necessary to explain to them the suffering of those who had stayed behind. Many expressed their astonishment at such desire to live and survive. When we asked them "Do you plan to stay? ", the negative or oblique answer brought us back to the bitter reality of emigration. It is true that December 2016 saw the end of the division of the city into two parts. It is true that since then, reconstruction has become a priority for both government and residents. It is true that some families who had fled the eastern part of the city, and whose house is more or less habitable, have returned home. It is true that water and electricity services have improved. But what counts are people. Those who fought the war and those who endured it. What about them, in what state of mind are they? Did they come out of it OK? How can the wounds of war be healed? How can we move towards reconciliation? How do we react to the violence of some people? What educational path should the children of war follow? What discernment can we propose to young people old enough to make decisions for their future? How can we support couples and families? And above all, how can we revive the flame of hope? We still hope that peace will reign over the entire country and that there be no more pockets of war like Idlib province and the countryside west of Aleppo and in northeastern Syria. We still have hundreds of thousands of families living in tents in refugee camps in the country and in neighbouring nations. The fact remains that the West must lift the sanctions that penalise the population. The Special Rapporteur on the negative effects of unilateral coercive measures on human rights, following his recent visit to Damascus, said: "I am deeply concerned that unilateral coercive measures are contributing to the suffering of the Syrian people. Given the economic and human suffering caused by these measures, it is difficult to believe that they exist to protect Syrians or to encourage democratic transition." Without waiting for any recommendations, we, the Blue Marists undertook for several years plans of education, human development and creation of work opportunities. The month of September was devoted to teacher training in our two educational programmes "I Want to Learn" and "Learn to Grow". Soumaya Hallak, Swiss of Syrian origin, trained them in post-traumatic body and music therapy. Bahjat Azrieh, a psychologist, introduced them to the "skills of life". Finally, Veronica Hurtubia of the Catholic University of Milan led a first stage of training in resilience in collaboration with the Bureau Internationale Catholique de l’Enfance (Catholic International Bureau of Childhood). The 90 children in the "I Want to Learn" programme started their year in early October 2018. The 55 children in "Learning to Grow" joined them in late October. During the summer months, their teachers came up with a programme adapted to the situations of our children. “Seeds”, a new team has come to boost our psycho-educational work. Five people will work with different age groups: from preschool to adults to young adolescents. 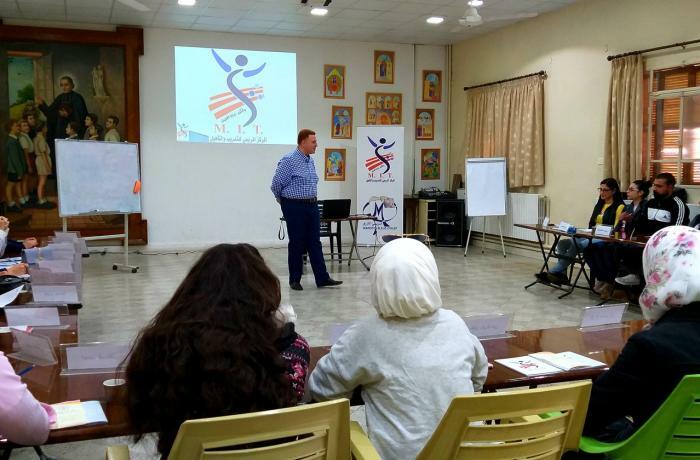 The "Women Development " programme brings together some forty women around several weekly training courses on important topics such as health, psychology, cooking ... [. . .] So far, we have funded 70 micro-projects. Christmas is just around the corner, bringing hope for peace and reconciliation. For our city Aleppo, for our country Syria, for our people, we hope that Christmas will be the time of coming together and not goodbyes. We work for a civilisation of love and peace, that it may reign over our land and hearts.